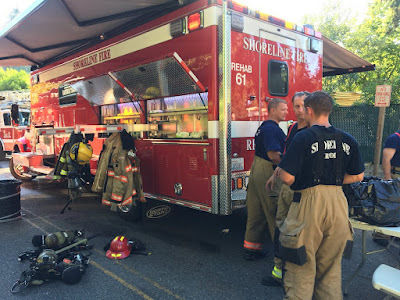 No one was injured in a building fire at the Ridge Acres Mobile Park in the 23200 block of Edmonds Way late Thursday afternoon, July 26, 2018. According to South County Fire and Rescue spokeswoman Leslie Hynes, the fire, in a two-story building that houses a print shop on the lower floor and an apartment above, was reported around 4:30pm. The fire went to two alarms to ensure that enough crews were available to rotate firefighters through, given Thursday’s high temperatures. Units from Shoreline and Northshore responded. As of 6pm, the fire was contained. No cause has been established but Hynes said the fire investigator has determined the blaze was not related to a fire earlier this month that damaged the mobile home park club house. A cause for that fire was not determined. Shoreline Fire took their rehab truck which allowed firefighters to cool off from the heat.